The Cabo de Gata natural park is home to some spectacular beaches. A couple of which, are consistently voted as being the best in Spain. One of our favourite beaches and one that is ideally suited to families with small children is Playa El Playazo, El Playazo beach. A popular beach that is located only 3.5kms from Rodalquilar on the north-eastern side of the natural park. Despite its popularity, El Playazo is big enough to always find a quiet spot. The sandy beach is 400m long and approximately 30m wide. The cove-like beach is hemmed in by the mountains on one side, providing natural wind protection and the impressive Castillo de San Ramon - San Ramon's Castle on the other. The castle was built in the early eighteenth century, as part of the Almerian coastal defences against Muslim pirate raids. The Castillo de San Ramon sits atop a fossilized sand dune and is surprisingly well preserved, providing a surreal backdrop to one of the most beautiful beaches on the coast. The sand is fine and golden, the water is calm and shallow, making it an ideal beach for young children. As with all the beaches in Cabo de Gata, the snorkelling and diving are second to none. You can easily snorkel straight off the beach, although you'd need to swim out a bit for deeper waters. There are also a couple of great hikes from El Playazo. Going rightwards and following a well defined track, you'll eventually come to the Cala Bergantín, a secluded and very picturesque cove. A fantastic spot for a picnic. One of our favourite hikes in the area is a 1.5kms walk from Playa El Playazo to the neighbouring beaches near Las Negras - namely La Cala del Cuervo. The cliff walk provides some exceptional views over the whole area and for the more adventurous, plenty of places for some cliff jumping. For more information - see top insider tips to Cabo de Gata. Access to Playa El Playazo is very good......by Cabo de Gata standards. The dirt road (ALP-826) that leads to the beach is in good condition and easily passable in all cars. Unlike many of the beaches in the area, there's no walking involved and you can easily park right next to the beach itself. Keep your eyes open for signs on the main road - the AL-4200 - for the turning. Playa El Playazo is clearly signposted. The track leads off into some typical desert landscape and quickly passes through a dense palm grove. Keep following the road downwards towards the coast. There are remnants of age-old Moorish style buildings that have been long since abandoned, all interspersed with palm trees and cacti. An exceptionally beautiful spot. Its easy to understand why Almeria is a favourite with Hollywood producers, including the recent visit by Ridley Scott who was filming his new epic 'Exodus' near here. For some recent pictures see Spanish High's G+ album. There is ample parking at the bottom of the track. Falling under natural park status, there are very few facilities. At the time of writing, there was a kiosk that sold water and snacks. As with all the beaches in Cabo de Gata, its best to bring everything you need with you. If travelling with small children and looking for a safe, protected beach, with excellent swimming conditions, a visit to El Playazo is highly recommended. For additional information and insider tips for things to do in Cabo de Gata, holiday lettings within Cabo de Gata natural park and for holiday rentals in Almería province. With turquoise waters and white sands, this beautiful beach could very well be in the Caribbean. Welcome to Playa de los Muertos in Cabo de Gata. 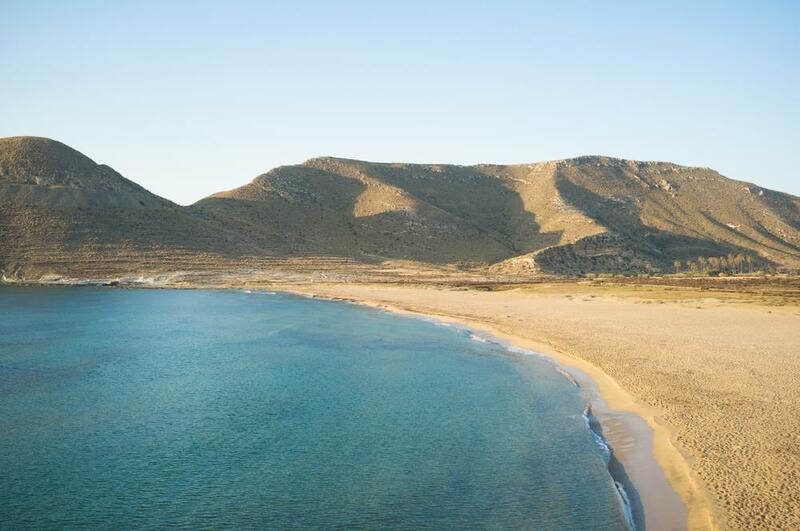 Monsul beach is considered by many to be the most beautiful beach in the Cabo de Gata area. Do you know the way to San José? Just look around when you do get there, some Spanish destinations are just perfect camera fodder! The scene of a ruined cortijo or farmhouse in Almería - where stars of Hollywood have filmed and Lorca found inspiration.